This 9mm Parabellum ammo offers good accuracy, reliable feeding and clean shooting at a reasonable price, especially in bulk. 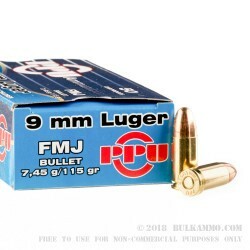 Ideal for range practice with any 9mm Luger pistol, it uses a 115-grain full metal jacket bullet and achieves above-average muzzle velocities in the 1150 fps range. 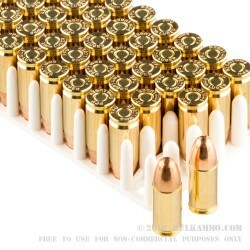 These rounds are cased in reloadable Boxer-primed brass, with 50 cartridges in each box. Prvi Partizan, a Serbian ammunition manufacturer, has operated since 1927 and is known for producing over 400 different cartridge types. In many cases, Prvi Partizan has become the sole producer of new ammunition for an older cartridge, providing a valuable service to owners of vintage guns. Founded by Jakob Posinger, the company initially specialized in hunting and military ammunition. Originally based in a military barracks, the company grew into a major employer in its home town of Uzice. In 1935, the city granted Posinger’s company land for a new standalone facility, the first private ammunition factory in the Balkans. The Factory of Arms and Ammunition in Uzice, as the company was then known, built a variety of products including ammo and rifles for hunting and military use. During World War II, the company’s properties suffered heavy damage from Axis invaders. However, resistance fighters, or “partisans,” moved in and re-established much of the production infrastructure, using a bank and several other industrial facilities as temporary housing. It is this period of production for the National Liberation Army that gives the company its present name, Prvi Partizan. After a long period of government control during the Cold War, Prvi Partizan became a public limited company in 1998. Today, it employs nearly a thousand people, owns three factories and exports ammunition all over the world. 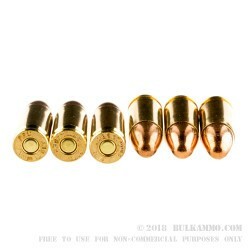 Awesome brass cased ammo and is very reliable. 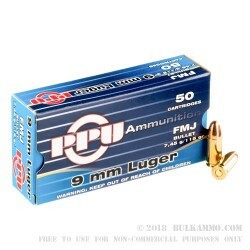 I had a terrible experience with this ammo, and will never purchase it again. I advise you to do the same. I bought 1000 rounds to use in my new Glock 17. I live in California, so I am only allowed a 10 round mag. After loading my magazine I was able to fire two shots without issue; however, after that is where I had some serious problems. On my third round I had an FTF which jammed my Glock. After clearing it and shooting my 4th round through, the fifth round had another FTF. This continued to happen for the remainder of my magazine. Having thought for some reason the issue may have been the way I loaded it. I attempted to fire another full 10 round magazine. The same issues occurred and had multiple FTF's that caused my Glock to jam. Frustrated, I purchased overpriced ammo at the range to see if it was my gun or the ammo. I was successfully able to fire 100+ rounds of different brands 9mm ammo through my gun without issue. Confirming the problem was indeed the ammo. I have seen mixed reviews on this ammo. Some people have no issues and love it, and I have seen other reviews on forums expressing the same issues I am having. Don't take the chance and stay away! Q: Is this ammo new or reloaded? A: Hi Peter, The 9mm 115gr. FMJ rounds by Prvi are factory new and not reloads. They have a lead core, copper jacket, and are brass cased.